Home Observations GPS > Which GPS solutions ? - The processing of GPS observations is particularly complex for the calculation of vertical movements of the land on which the tide gauges are placed (movements of the order of mm/year). The article published in 2007 by the members of the consortium of the ‘ULR’ GPS analysis centre describes the difficulties and the challenges raised by this issue. 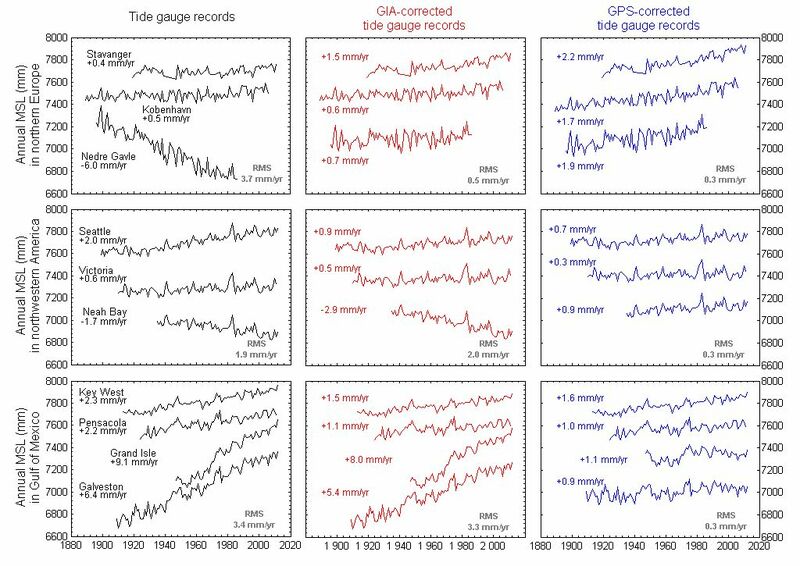 The figure opposite illustrates the challenges : shown on the left is a series of average sea levels measured with tide gauges ; in the middle the series are corrected with the predictions of the de postglacial rebound model ICE5G (VM2); on the right with the GPS velocities obtained by the ‘ULR’ centre in ITRF2008. - To meet this challenge SONEL relies on the ULR analysis centre whose computation facilitiy is situated at the University of La Rochelle. The cluster acquired in 2008 reduced significantly the calculation time, from 1 year down to 2-3 weeks to process 10 years of GPS observations from a global network of some 200 stations. This has opened up new perspectives of experimentation and important avenues of research (new strategies, modeling, corrections). In particular, it enabled the ULR group to collaborate with 9 of the most prestigious groups in the spatial field in the first reprocessing campaign of the international service IGS. The latest ULR solution published in Global and Planetary Change is available in SONEL as time series of daily positions and velocities. Click on the link below to obtain more details and retrieve the results.